Do Degenerative Meniscal Tears Require Surgery? - Jeffrey H. Berg, M.D. Do Degenerative Meniscal Tears Require Surgery? Do degenerative meniscal tears need surgery? Like most things in healthcare…It depends. Degenerative meniscal tears differ from other meniscal tears in that they occur more due to “wear and tear” than due to an acute injury. In younger people, the menisci – those cartilage rings in your knee that sit between the end of your thighbone and the top of your shin bone – are strong and firm. As we get older, our meniscus becomes weaker and softer. As a result, tears of the meniscus occur more easily and more often with increasing age. Additionally, as we age, arthritis of our knee is more common. As our knee develops arthritis, the entire joint degenerates. The cartilage, the bones and all the structures in and around the joint…including the meniscus, degenerate. 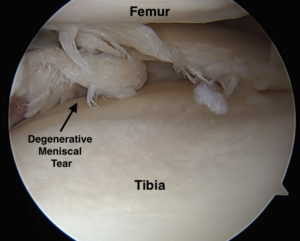 This degradation can lead to degenerative meniscal tears. So degenerative meniscal tears are commonly found in arthritic knees. Whether the tear will lead to pain, however, depends on whether the origin of the tear is a result of the first cause I discussed above or the second. Furthermore, because the meniscus is firm in younger patients, when it tears, the loose flaps usually remain as irritants inside your knee and therefore your knee continues to be painful. This is in contrast to older patients with degenerative meniscal tears. Once again, in those cases, the meniscus is softer. This not only means that the meniscus can tear more easily, but it also means that after a while, even though the tear doesn’t mend, you’re symptoms may resolve on their own. Although this may occur, it doesn’t always occur. And even if it does occur, it may not occur quick enough for you. So sometimes surgery is required to remove the irritating torn meniscal fragments and to relieve your pain – even with degenerative tears – even when arthritis exists. If you have an isolated degenerative meniscal tear that remains symptomatic despite nonoperative treatment or remains symptomatic longer than you would like, arthroscopic meniscectomy is likely to help. 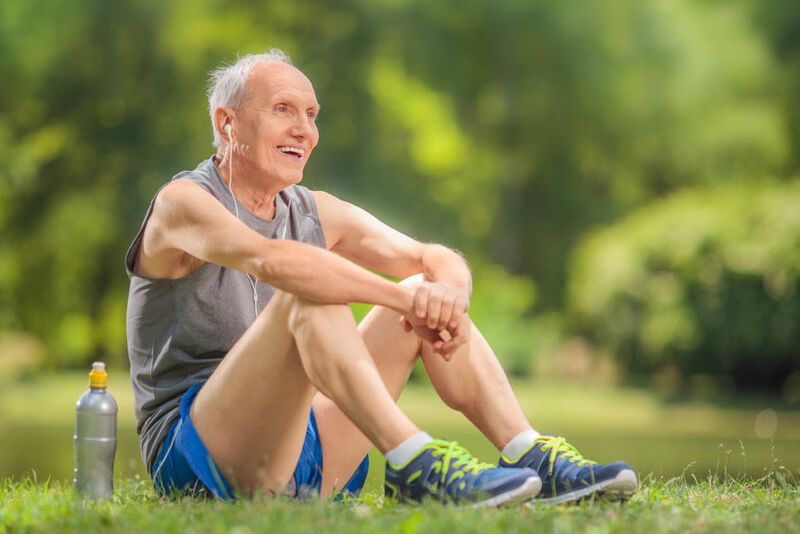 When you have both arthritis and a degenerative meniscal tear in your symptomatic knee, your symptoms may be coming from your arthritis, your meniscal tear or both. The main point to understand is – You can have both a meniscal tear and arthritis…and the meniscal tear may or may not be causing any symptoms. Arthroscopy is very good at taking care of meniscal pain. It is not so good for taking care of isolated arthritis. Therefore the success of your arthroscopy will depend on what is causing your symptoms. If its your meniscal tear, you have a very good chance of getting relief from these acute symptoms. That doesn’t mean, your arthritis won’t progress and you won’t have any further knee problems in the future. Arthroscopy can’t stop arthritis. Sorry, the natural history for all of us is arthritis followed by death – No surgery can prevent that. Conversely, if your symptoms are only from your arthritis, the chance of arthroscopy helping you is not nearly as great. Who it will help, how much it will help and for how long is very unpredictable. In fact, in a small number of patients, the symptoms may even get worse after surgery. Finally, if your symptoms are coming from both your arthritis and your degenerative meniscal tear, you may have a mixed picture. How symptomatic your meniscal tear is, will determine how much relief you can expect. Degenerative Meniscal Tears: What To Do? So what to do with this information? Do what’s right for you. When faced with this dilemma, I tell my patient that we can tackle their problem in one of two ways. Both will get us to the same point, but take a different path to get there. Only after we are done, will we know which path was correct. We can initiate treatment non-operatively. We can try antiinflammatory medications, sometimes physical therapy and rest. If arthritis exists, we can consider an injection. Then, if the usual nonsurgical treatments fail to give satisfactory improvement, we can proceed with surgery, arthroscopy or even a knee replacement, if there is associated arthritis that warrants it and the symptoms are significant. Alternatively, we can initially treat the meniscal tear whether associated with or without arthritis as if the tear is the primary cause of the symptoms. We can perform arthroscopy. If you get better – Great! – We chose correctly. If not, we can then treat as we do for symptomatic arthritis. When a degenerative meniscal tear exists, we can start with a nonsurgical or surgical treatment plan and ultimately get to a resolution. You get to choose what is best for you – That’s the real world and real medicine!